We have put this 'Executive Golfing Holiday Package' together with one thing in mind - 'Quality'. Ideally suited for a family or indeed for small groups (minimum 4 passengers) who require large private accommodation on the beach but also close to a top golf resort. You will stay at the Sanctuary Resort, So Ho Tram, Vietnam, located just 2 hours drive along the coast from Saigon. This fabulous beach retreat consists of 27 luxury - 3, 4 & 5 bedroom villas, 7 Beachfront villas and 20 Riverfront villas all with private pools and private gardens. The Sanctuary Resort is ideally located and only 10 minutes drive away from the impressive Greg Norman 18 hole designed - Bluffs Golf Course. You could stay in a hotel, but we firmly believe that you will get better value by staying in a large private villa that offers you total flexibility by not only having separate sleeping and living areas, but actually gives you much more space than a hotel room/suite. This is why we are recommending the Sanctuary as a perfect base. A Home From Home. * 2 Upstairs en-suite master bedrooms both with queen beds. * 2 Ground floor en-suite bedrooms both with queen beds. * Living room with a 3 seater couch, 3 single chairs, 2 circular coffee tables and 1 indoor day bed. * Media room with 42" LED LCD Samsung TV, 5.1 Channel Sony surround sound, day couch and 2 single chairs. * Fully fitted kitchen including cooking utensils, fridge and freezer. * Private pool and also private garden. The Bluffs Ho Tram Strip was designed to capture the true essence of links-style golf. Set on the coastline -- as almost all great links courses are -- The Bluffs is routed over and around towering sand dunes, which have been shaped over thousands of years by the elements. The wind plays a major role in the experience here; it's always strong, and its prevailing direction differs depending on the time of year. The course's designer, Greg Norman: "The experience of playing true links golf among the dunes of southern Vietnam and having dramatic ocean views throughout your round will make The Bluffs Ho Tram Strip one of the most unique golf experiences in the world." * Return International flights in a choice of either Economy, Premium Economy, Business or First Class. 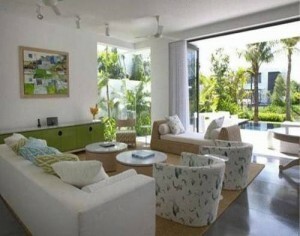 * Accommodation in a choice of 3, 4 or 5 Bedroom Villas, either Beachfront or Riverfront location. * Private return airport / accommodation transfers. * Pre-booked golf days with pre-planned Tee Off times. * Services of an Atlas Group Transfer Representative in Vietnam. * ATOL & ABTA Financial Protection. (Your holiday is 100% protected through our own travel licences). * VAT & local Vietnam taxes. Our Vietnam Golfing Holiday will be organised using our tried and tested 'Tailor-made Service' giving you total flexibility on your travel arrangements. Your holiday will be structured to your exact requirements.